Finally! Tower57 game is now out for all AmigaOS4, MorphOS and AROS users that have backed up the game on kickstarter. 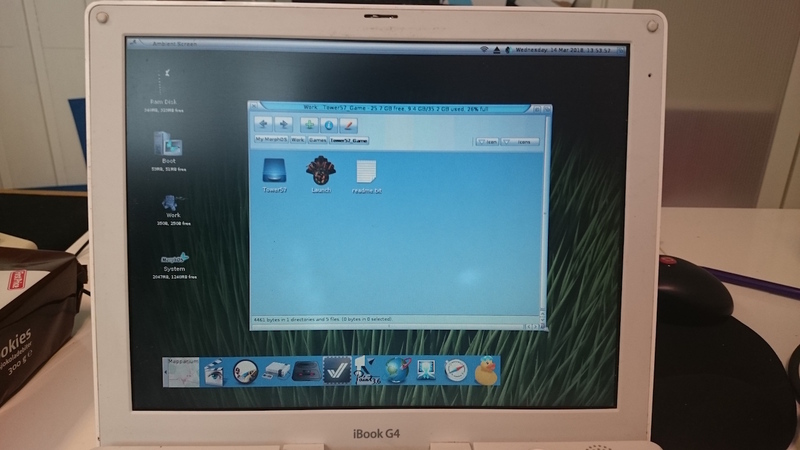 Amitopia have tested the game on both iBook G4 1.33GHz and PowerMac G5 2GHz with MorphOS 3.9 installed. Tower 57 plays ok on iBook G4 with certain slowdowns in 1024×768 screenmode. However! On our PowerMac G5, Tower 57 game runs really fast with no slowdowns at all. With a few slowdown issues on our iBook G4 with MorphOS. I wasn’t expecting to see Tower 57 running smoothly in 1920×1080 on our PowerMac G5! But it did! On our PowerMac G5 with ATI Radeon 9600 PRO, Tower 57 runs way better than the Steam version of the game on my iMac i7 and on my MacBook Pro Retina i5. I didn’t expect it to run this well. Although on the PowerMac G5 version the game showed white stripes at certain times. But this should be fixed very soon. The Tower 57 game engine really seem to require power. But it is nice to see that PowerMac G5 plays the game really well! Except for the slowdown issue on iBook G4 1.33GHz (which isn’t that noticeable, but can happen at certain times), the game seems to deliver. The fact that the game made to the nextgen AmigaOS platforms is really nice. Great job! The gameplay, graphics and music is awesome in the Tower 57 port for AmigaOS. The loading music part is missing and multiplayer on-line is grayed out. But hey! I am happy for what the AmigaOS got for sure! However! I keep my comment valid that I posted on distrita.com when I reviewed this game. I even think it’s even more valid now after trying the AmigaOS version! If Tower 57 as any game that is made today keeps on making engines that is not optimized (not just Tower57! ), that also even tries to mimic classic Amiga graphics. Then these games should run without issues on any GHz CPU’s of today. All of the Steam and GOG games that is using Chaos Engine alike type of game engines should have been developed in Assembler instead of slow C if this is the case but they aren’t because of the time it takes to make them and I understand that. But! It would make these 2D games run as they should. Instead many of these games with pixel graphics got 2D game engines that is slower than even Quake 1 engine that requires much less CPU power to work. Tower 57 and any games out there that tries to mimic Amiga graphics would run smooth as Chaos Engine Remastered does which you also find on Steam for PC! That’s why I keep my word saying that if Tower 57 was made in Assembler and that it would demand 68030 to run or higher. Then this game would without issues run on classic Amiga or even 68080 FPGA accelerated Amiga’s today. All Amiga machines are made for be able to do this kind of graphics and type of games. They can for sure handle todays pixel alike games without any issues, if they were made in a programming language that is fast on the Amiga. I am not saying that coding in C or C++ is bad at all since it is a great developer standard today. But those developers that is making Amiga games in Assembler today is able to optimize games so that they worked faster and better. Also most of classic Amigan’s today got a 68030 cpu or better installed. Most of today’s games that you find on Early Access or as full releases on Steam and GOG that uses pixel graphics is often using 500MB, 1GB or even 3GB in HD size versus Chaos Engine that is maybe 2MB in size! Tower 57 however is only 238MB in size. The coders have made a fantastic job. It’s really great to see Tower57 for the nextgen Amiga. People that however claims that classic Amiga can’t do Tower 57 alike games, is those that also often claim that the Amiga isn’t able to handle the amount of animations and objects at the same time on the screen. Well! This is simply not true at all. Cannon Fodder, which is one of the most popular Amiga games of all time got also lot’s of action going on. Here is a perfect example of a game that is controlled with the mouse as in Tower 57 that got massive actions going on with objects exploding, objects to collect, objects to fire and objects to throw. And all this action in Cannon Fodder happens at the same time while the birds is flying over the screen, sound effects of wind and water is played etc. Cannon Fodder is a single layer game, but graphics chipset that sits inside Amiga is able to handle the action pretty well and thats on a plain 68000! When AGA was introduced, the chipset introduced support of having several screenmodes layers on top of each other even. Just look at Super Stardust that uses this technique. Those Amiga developers and Bloodhouse knew how to code on the Amiga! Chaos Engine or even Alien Breed Tower Assault by Team 17 is also similar to the type of Tower 57 game. Chaos Engine graphics is even what Tower 57 is based on totally. Chaos Engine on the Amiga and on other platforms got several objects and animations going on at the same time on the screen at once. Lot’s of explosions and more like in Cannon Fodder. Amiga with 68000 can handle this, so on 68030 or higher which is faster. Tower 57 with a similar engine just made in Assembler and for the Amiga screenmodes would for sure handle it better or at least on a Vampire 68080 FPGA Amiga. Just look at T-Zero by ClickBoom. That shooter really needs 68030 and it plays in PAL Highres screenmode too. Tower 57 type of gameplay is fully possible on the Amiga, if it was written for the classic Amiga for sure! But time and income seems to be more and more important than quality. The people behind the AmigaOS port have done a fantastic job optimize this game engine. But this game engine struggles on our iBook G4 1.33GHz in 1024×768 with a ATI Radeon 9200. On our PowerMac G5 2GHz in 1920×1080 it flies really great. As a Amiga user since 1988, I really enjoy seeing commercial made games for Steam been ported to AmigaOS. Even if its nextgen AmigaOS. I have played it a lot on my Mac or even PC! But now also be able to play it on my PowerMac G5 pretty well also in MorphOS. I haven’t tested the AROS or AmigaOS 4 version, so I can’t compare the versions. But this is really good work. I am proud of those that have made the effort of porting it to AmigaOS 4, MorphOS and AROS. Even if I know that there are devs of the AmigaOS ports that disagree with my view, I really really love what you have done. How is Amiga game developers capable of making 2D platformers as they should, when most of the game developers that uses Amiga alike graphics in commercial releases doesn’t? Or even C64 alike graphics? Tower 57 is a fantastic game. I love the plot, the story and the gameplay. But these types of games should require 68030 or at least minimum Quake 1 specs. Tower 57 plot and gameplay is Way to good for not having the best optimized engine there is. I would do anything to help Tower 57 onto classic Amiga for sure! Kickstarter, promote, marketing etc. At least on 68080! Why not? This score here is based on playability on nextgen AmigaOS. Playing this on a PC or MAC with superpowers is really awesome. Also on our PowerMac G5, Tower 57 flies. 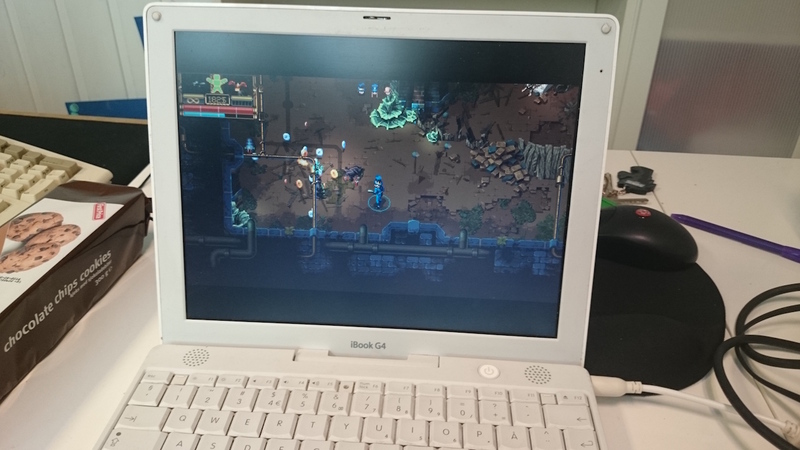 I really love to play it on our PowerMac G5, but on iBook G4 1.33GHz the gameplay isn’t fluid. The FPS counter says 32FPS to 35FPS but the gameplay itself is laggy for some unknown reason. Maybe there will be a fix regarding this later? I don’t know. Music however could have got full score, but they choose to skip the Awesome loading music from the PC and Mac version that you can find on Steam version isn’t presented neither on G4 or G5 when testing the MorphOS version of the game. There is also no on-line function working for the Amiga, but you can play locally with a friend. Other than this. Tower 57 port for AmigaOS is amazing. I really love the graphics, gameplay, animations, sound effects and music. Using the mouse for aiming and shooting works really well. Also usin W, A, S, D letters for moving the character around works nicely. The gameplay reminds me of Chaos Engine and Cannon Fodder mix. The enemies, graphics and everything that is designed in this game looks really well. The design in this game is amazing, so all kudos goes to those that made them. Also the sound effects and music. It really fits the theme of the game. Tower 57 is a brilliant Steam game that is well ported to AmigaOS. 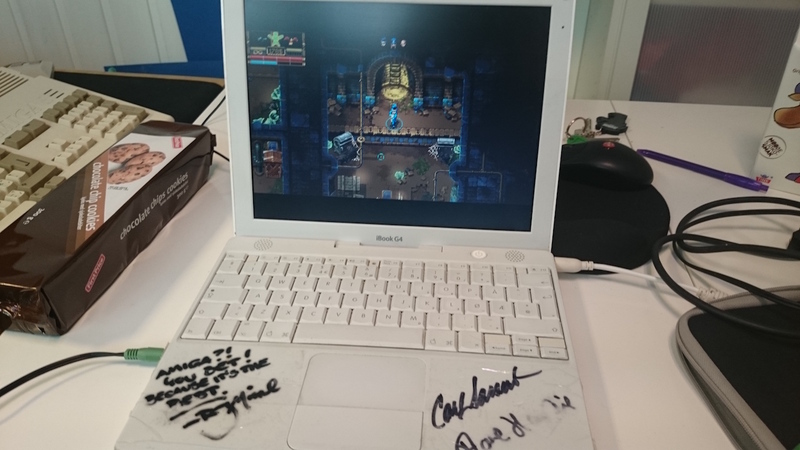 But to be able to play the game without hickups on MorphOS which is our testing platform for this review, then you need something stronger than iBook G4 1.33GHz. 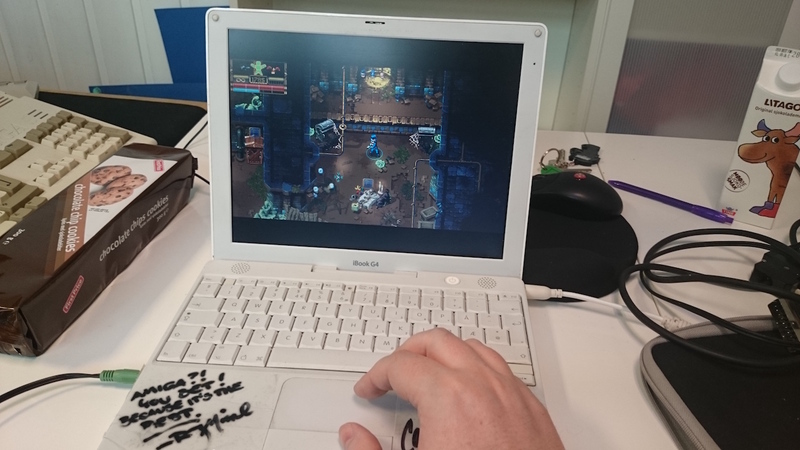 People have reported to me about nice gameplay on PowerBook G4 1.64GHz laptops with MorphOS on them. But this I haven’t tested yet. So this score is based on my test play on iBook G4 and PowerMac G5 with MorphOS 3.9 installed on both of PowerPC Macs.